In the previous class, we have got a blank page but with a title in the title bar . Now we want to add some content. Here is the solution for the mouth dropping question how to make a free website using html in 5 minutes. Please have a look on the below image containing source code. From 3rd line to 5th one belongs to head tag (which we already discussed in lesson 1). In between the starting and closing head (that is 4th line) tag. 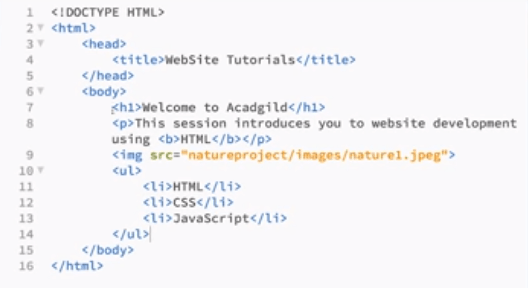 we can see a title tag with title “website tutorials”. So it is our title and in the web browser tab this title will be showned. Now come to the body tag. here all the vital contents, which is shown in the website to users will be scripted. 6th line is the starting tag of body. 7th one is a headline tag, h1 shows that it is headline1. which means it is the largest possible headline ( Large in case of font size). Similarly we can 6 headline tags (h1, h2, h3, h4, h5 & h6). 8th line shows a paragragh. all the content in between [ <p> and </p> ], will show as a paragrah. Here in the 8th line itself we can see another tage ” <b> HTML </b> ” here the word HTML will be presented as bold. so <b> is used to bold letters. instead on <b>, we can also use <strong>, both have same results. Next line (9th) is for an image, their should be a white space between img and src. src means source of tyhe image. Here the source is a jpeg image called nature1. which is in image folder and this image folder is in nature project folder. 10th line shows <ul> element which represents an unordered list of items, typically rendered as a bulleted list. which is followed by <lil> elements each lil elements shows each items in the list. here the list consist of 3 items. In line 14 we are closing the tag of ul element. Then closing tag of body and finally html. If you run this program you will get a simple website which is shown below. please look into it.